After a 17 year hiatus, Sally has returned to her instructor role at Lovelane. Sally graduated from Hood College in 1987 and started volunteering for Lovelane in 1989. She earned her MA instructor license in 1989, received her NARHA certification in 1992 and is currently pursuing her PATH Therapeutic Riding Instructor certification. 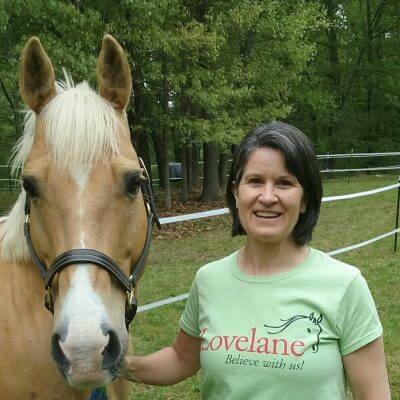 Her favorite part about working at Lovelane is seeing the joy and confidence that students experience and the ability to work with inspiring students, families, volunteers, staff and horses. Sally loves to see how the movement of the horse benefits the students on so many levels: physically, cognitively and emotionally. She also loves that therapy is coupled with a fun and motivating activity.